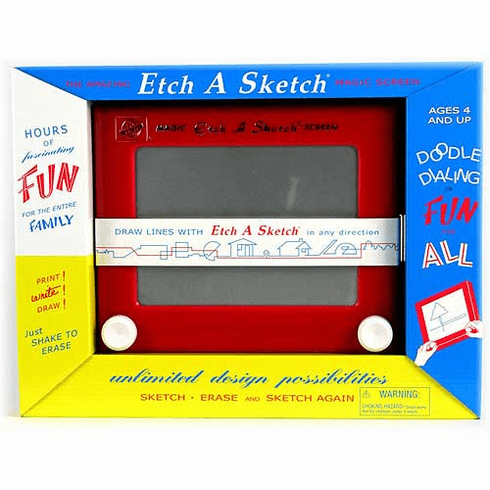 It's Classic Etch A Sketch¨ in a 1960s package design for retro fun! Just like the original, simply turn the horizontal and vertical knobs and watch the magic lines form! Once you get the hang of it, you'll be drawing buildings, cars and even people in no time! All it takes is a steady hand and a creative spark. When you're finished, just shake it and the picture disappears! So get twisting and shaking to hours of picture-making excitement with this timeless, portable art studio! Ages 4 and up, screen size 6.25" x 4.25".